In 2019 the nation will be celebrating the 150th anniversary of the completion of the Transcontinental Railroad. The construction of the Transcontinental Railroad was the most significant project in the world in the 19th century. It was like going to the moon in the 20th century: few thought it was possible with the technology of the time. It involved constructing 2,000 miles of railroad over two major mountain ranges, the Rocky Mountains, and the even more difficult Sierra Nevada. Both crossings were at a higher elevation than any railroad in the world up to that time. The Central Pacific Railroad of California was incorporated on June 26, 1861 in Sacramento, more than a year before the Union Pacific railroad was formed in the East. The single person most responsible for getting the Pacific Railroad Act of 1862 passed by Congress was a Civil Engineer in California, Theodore Judah, a member of ASCE. Construction of the Central Pacific Railroad started on January 23, 1863 in Sacramento, over 2 and ½ years before the first rail was laid by the Union Pacific. By far the most difficult and challenging part of the route for the Civil Engineers and the construction workers was crossing the Sierra Nevada. The construction of the Central Pacific required the effort of thousands of Chinese immigrants that made up 90% of the work force, with many of their descendants currently living in California. 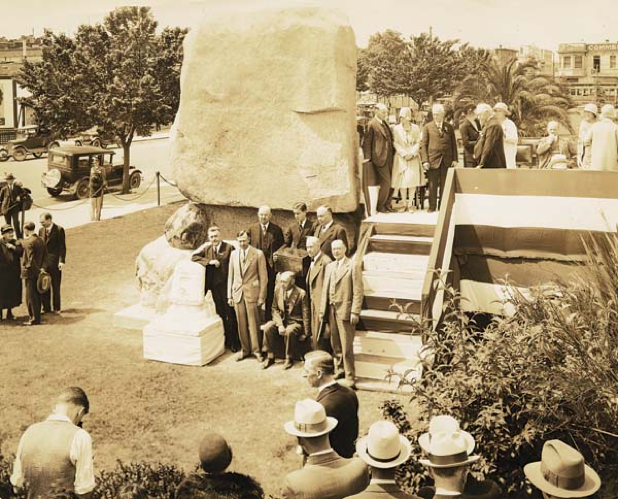 The Theodore Judah Monument cornerstone being dedicated on April 25, 1930 by ASCE President John F. Coleman during ASCE’s National Convention in Sacramento. The ASCE Region 9 and the Society History & Heritage Committees have started planning activities for the celebrations in 2019. The major ASCE activity will be a Railroad History Symposium in Sacramento in May of 2019. 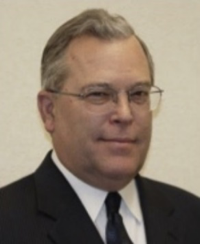 It will include speakers on topics of Railroad History, concentrating on the Transcontinental Railroad and the railroad technology of the time. Tours and field trips will be conducted before or after the Symposium. Look for announcements from ASCE coming out in early 2018. The nominated project must represent a significant facet of civil engineering history, and must have contributed to the development of the nation or a very large region. The nominated project needs to be at least 50 years old. A local Section and Region must officially nominate the project. 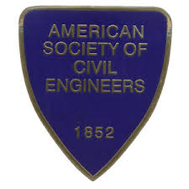 If approved, ASCE will supply the 13” X 19” bronze plaque. The Section will organize a Dedication Ceremony to be attended by the Society President or their delegate. The criteria for the Local or Regional award are less stringent, but similar. The Region 9 History & Heritage Committee will assist and support local efforts in preparing the Award applications. If you have any questions or ideas for awards, please contact me at chuck.spinks@outlook.com, or the committee Vice Chair, Andy Machen at andrewmachen@rivsan.com. 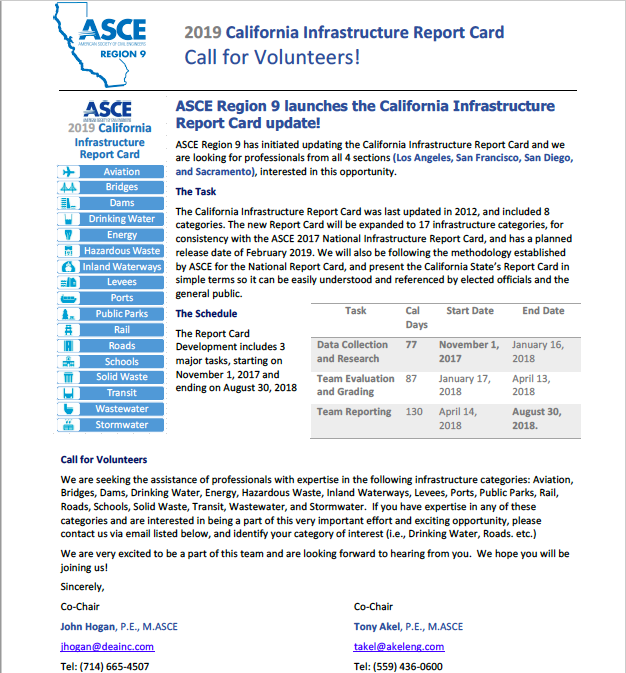 ASCE is nearing the completion of a two-year long process that will result in a major update to the Society’s Strategic Plan. In my recent November newsletter article I had noted that the Society’s top three strategic initiatives for the past several years have essentially been: (1) Sustainable Infrastructure – where members are dedicated to ensuring a sustainable future in which human society has the capacity and opportunity to maintain and improve its quality of life indefinitely, without degrading the quantity, quality, or the availability of natural, economic and social resources; (2) The ASCE Grand Challenge – established to reduce the life cycle cost of infrastructure by 50% by 2025 and to foster the optimization of infrastructure investments for society, and; (3) Raise the Bar – seeking to advance the profession and the public welfare by actively supporting the national movement to raise educational requirements for licensure of future professional engineers. The new ASCE Strategic Plan will encompass new goals to chart our Society’s future. Six new goals have been developed for the Society going forward. The new goals will be accompanied by several Key Performance Indicators (KPIs) to ensure that the goals are substantially achieved in the coming years. Strategies necessary to achieve these goals are currently in development. A final decision on the strategies and the entire strategic plan is scheduled for the March 16-17, 2018 Society Board meeting in Arlington, VA. Several ASCE leaders are currently involved in the process. These include Section & Branch Presidents or committee chairs who oversee a committee; the Board of Directors; and some constituent committees of ASCE. These entities have been tasked to gather input from fellow officers, local board members and committee members towards the plan. Region 9 members can contact their local leaders to provide input towards this effort. Written comments on the new Goals are to be submitted electronically to ASCE at stakeholder@asce.org no later than December 14, 2017. I just returned from attending the ASCE International Conference on Sustainable Infrastructure in New York City and I’m feeling energized and inspired. As you can clearly deduce from the name, the conference promotes sustainability. Which got me thinking about what sustainability means to me especially as I embark on my new role as Region Governor of the Los Angeles Section for California. Society is facing daunting current day challenges that will task our civil engineering profession. Our technical and leadership skills are needed now more than ever to address climate change, aging infrastructure, long-term resiliency needs, dwindling financial resources, and increased poverty levels, just to name a few. Civil engineers will be tasked with finding solutions to problems never before faced. Decisions we make today will have huge economic and social impacts not only to today’s society but to future generations. It is clear that these new challenges require new approaches based on new types of thinking. And while we are all trying to figure things out, we do not have to go at it alone. The conference made it clear that cross collaboration and knowledge sharing goes a long way and we are stronger together. ASCE has always been a great resource for me going back to my college days and I have remained active throughout the years in several different capacities. It is where I first established professional relationships that I carry with me to this day. In September, I was sworn in as Region Governor at ASCE Headquarters in Reston, Virginia during the President’s & Governor’s Forum and Leadership Orientation Weekend. The event was awe inspiring and I do not take this responsibility lightly. Arriving for the first time at the ASCE mothership felt like coming home. I had the privilege of meeting the dedicated ASCE staff that work diligently and behind-the-scenes in strengthening our profession at a global level. The event also brought together dozens of volunteers just like me committed at giving back to a profession we love. That weekend reminded me that I follow in the footsteps of those that came before me. And, yes, in order to maintain a sustainable leadership pipeline, it will be imperative that my shoulders serve as a foundation for future generations. 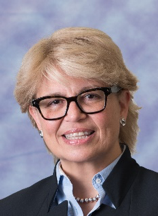 We must inspire them to think holistically with economic, social, and environmental issues in mind; to innovate, remain curious, and pursue the art of the possible; and broaden the profession’s technical excellence and professional leadership. What better way to do so than to encourage working to implement ASCE’s goals and strategic initiatives. From what I see, the next generation is ready, able and willing to do so and I am hopeful in what the future holds.